Montgomery County Economic Development Corporation is a privately held organization whose purpose is to promote Montgomery County as a prime location for businesses to thrive and expand. Working together with MCEDC to advance the County’s economy are WorkSource Montgomery, who connects businesses with top workforce talent, and Visit Montgomery, who promotes the county as a destination to work, live and play. The challenge was to provide a work environment that would satisfy the evolving requirements of these startups, with the flexibility and collaborative environment all three entities were striving for. 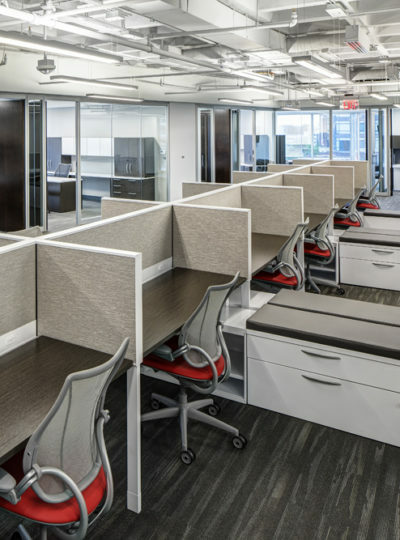 Occupying about 10,000 square feet, the space offers multiple work place options for executives and staff. 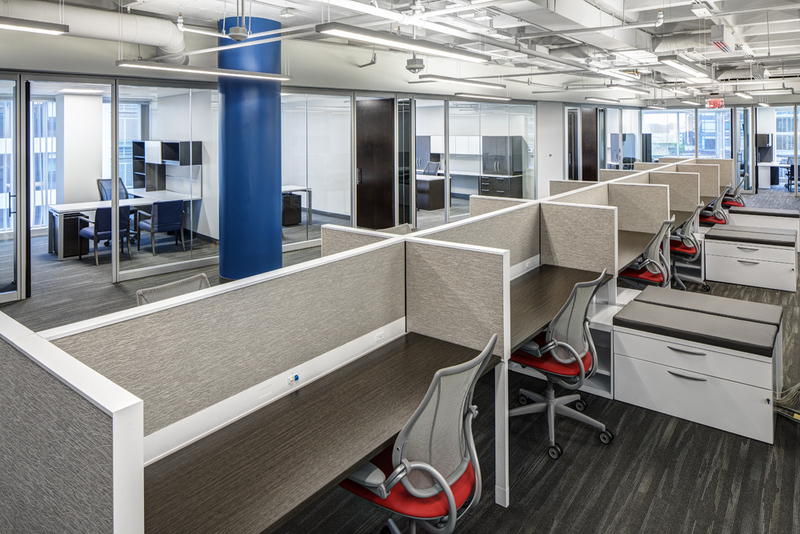 Glass front private and semi-private offices extend the natural light to the workstation and benching clusters. 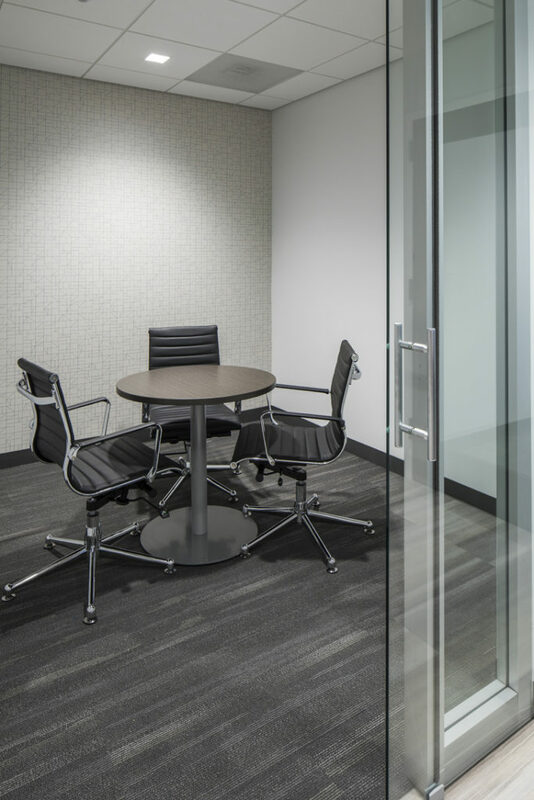 Collaboration can occur in a variety of places including the large and medium conference rooms, huddle rooms, and multi-functional break room. It was critical that there was no clear definition separating the three companies housed here, as their interaction is a part of their success. 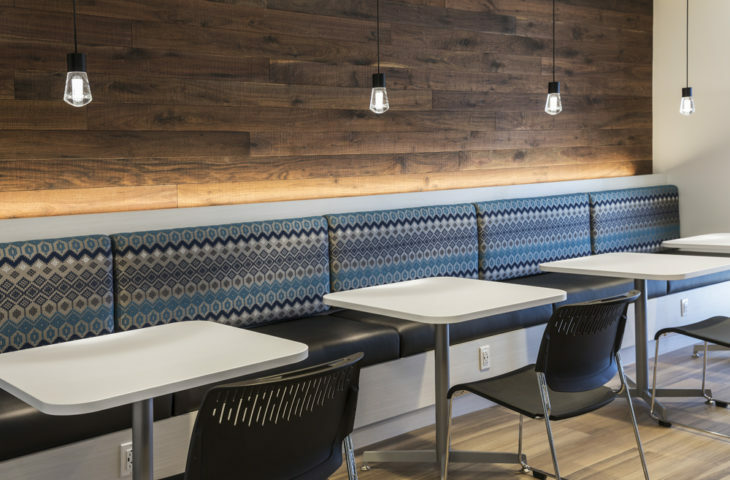 In addition to an open feel, it was important to MCEDC to incorporate a variety of textures for interest, as well as utilize environmentally friendly elements. 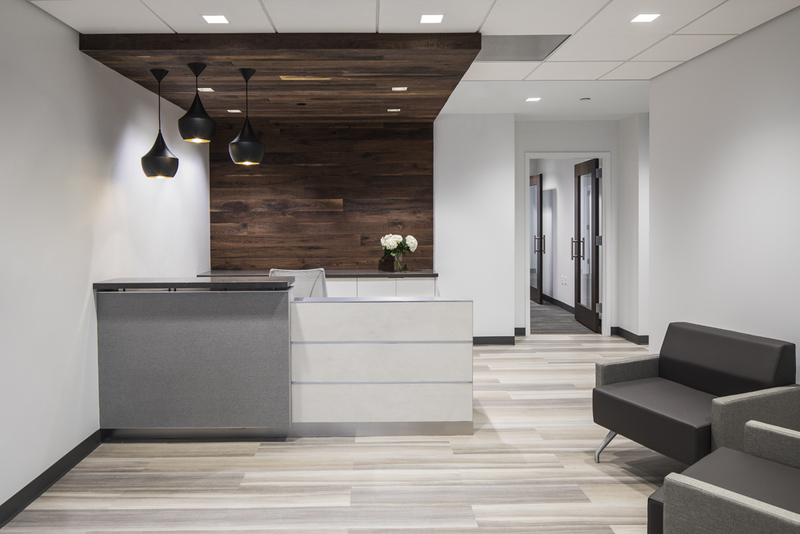 Starting in Reception, one is greeted with a variety of textures from the wood look LVT on the floor, to the reclaimed wood on the feature wall and ceiling, to the range of materials used on the reception desk. 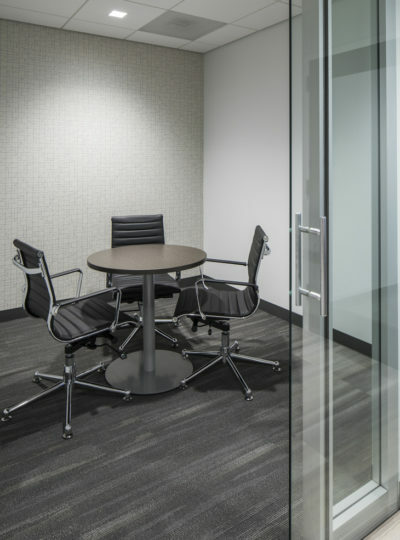 Texture continues to flow through the space as the flooring transitions to carpet tile, and the open office area ceiling is left exposed revealing a 2 way waffle slab. Many of the reception area’s finishes are repeated in the sunny break room with the addition of a graphic fabric on the built in banquets. The following were used to incorporate “green” elements: all of the lighting is LED with the majority on dimmers; low/no VOC paint; the LVT is certified for low VOC/100% recyclable and up to 20% by weight recycled content; the carpet tile backing is 100% PVC free and Green label plus certified for indoor air quality; the banquet fabric is GreenGuard Gold Certified; the Timber Walls wood product qualifies for 6 different LEED Credits; maximization of natural daylighting; and Energy Star appliances.